Aside from their house warming and aesthetic appeal, burning all natural candles is actually beneficial for you and the environment! Unlike paraffin candles created from synthetic materials, all natural beeswax candles burn clean and emit negative ions that purify and clean the air. With proper wick maintenance, all natural candles are dripless and will burn even brighter and longer than others. We control the ingredients that go into our product to ensure our selection of all-natural candles is chemical free. No chemical processing means no synthetic, overwhelming fragrance – just the faint sweet aroma of liquid gold! Our selection of homemade beeswax candles is made entirely from scratch with high quality ingredients. We remove yellow cappings from the honeycomb during extraction and melt them down into candle molds, ready for you to burn! 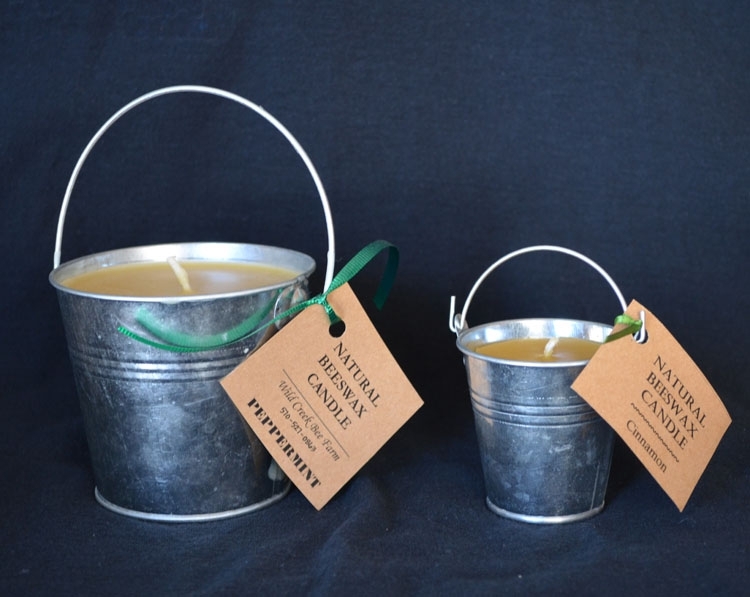 Available in two sizes, this beeswax candle with essential oils comes packaged in a decorative tin pail with your choice of essential oil for a mild scent. Our candle in a tin is one of our many products that makes a great gift! Dripless – in a draft-free environment & a properly trimmed wick. Cleansing – Beeswax candles are known to create a negative ion when burning. The negative ions drawl odors out the air and reduces dusts & allergens in the home. CHEMICAL FREE – Beeswax is natural and free of toxins. (Paraffin is petroleum/oil bi-product). We only use essential oils for scenting. BLOOM – ever wonder what the white residue is on your beeswax candle? It’s called Bloom! Bloom is the result of the natural components of the beeswax coming to the surface. It’s a true sign of a pure beeswax candle. If you’re not a fan of bloom, simply wipe the surface with a lint free cloth (pantyhose work great) or sit the candle in the sun for a while. NEVER LEAVE A BURNING CANDLE UNATTENDED. Take care in placing candles on a proper surface in case of dripping wax. Candle colors will vary due to natural coloration of beeswax.